This winter spiced granola tastes a little bit like christmas, but more like a delicious bakery serving cinnamon buns by the bucket load. It is laden with ground ginger, cinnamon, allspice, chewy dates and pine honey. 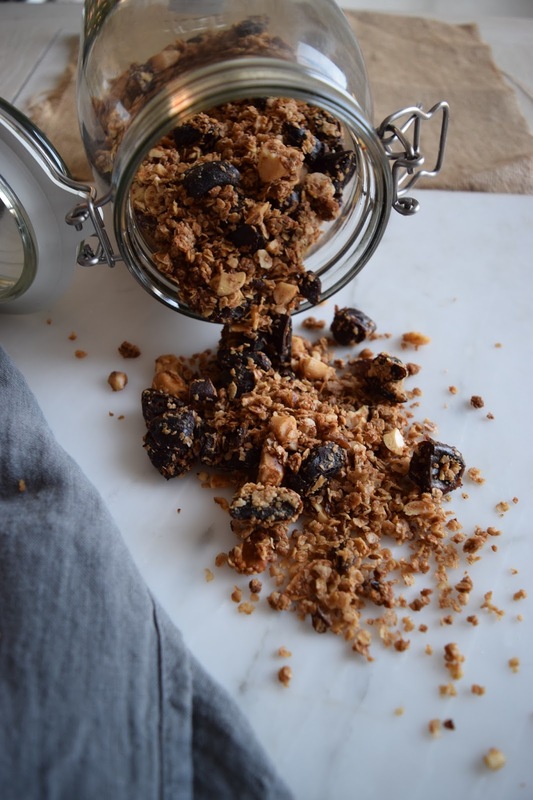 I like my granola to be really, satisfyingly chewy so I put plenty of dates in this mix. Not only does it add sweetness, once baked these become deliciously chewy, making you take your time over breakfast, making it last longer and of course keeping you fuller. 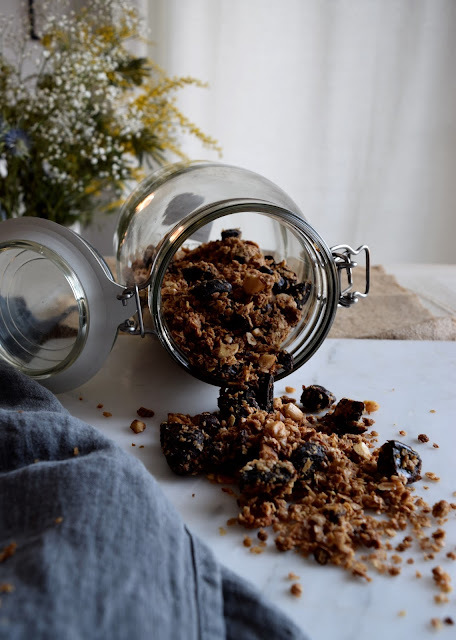 Now, you can add pretty much whatever you like to your mix, really what ever you have left over in the cupboard - dried cranberries are brilliant, as are jumbo golden raisins or goji berries if you fancy a tangy bite and any chopped nuts you can get your hands on. I like brazils and hazelnuts in mine, but almonds, pecans or walnuts all do the job just as well. First pre heat your oven to 150C and line a baking sheet with baking parchment. Next weigh out your oats, add in your spices, mix all of this together with your hands, add in your chopped dates (or any selection of dried fruit you have decided to add in), chopped nuts and salt, mix well. Enjoy with hot berry compote and fresh tangy Greek yogurt for a reviving January breakfast!